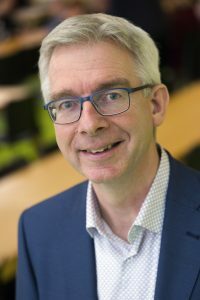 Albert Polman is Scientific Group Leader at AMOLF, one of the research institutes of the Netherlands Organization for Scientific Research (NWO) in Amsterdam, the Netherlands, where he heads the Program “Light management in new photovoltaic materials”. He is professor of Photonic Materials for Photovoltaics at the University of Amsterdam. Polman obtained his Ph.D. from the University of Utrecht, was post-doctoral researcher at AT&T Bell Laboratories, after which he became group leader at AMOLF where he also served as director from 2006-2013. He spent a sabbaticals at Caltech (Pasadena, CA, 2003-2004) and the University of New South Wales (Sydney, 2017-2018). Polman’s group is the inventor of Angle-Resolved Cathodoluminescence Imaging Spectroscopy (ARCIS), a novel imaging technique with deep-subwavelength resolution. The ARCIS technique has been commercialized the start-up Delmic BV, of which Polman is co-founder. In 2014 Polman was awarded the MRS Materials Innovation and Characteriation Award for the development of the ARCIS technique. Polman’s most recent research focuses on nanophotovoltaics, the study of light management at the nanoscale to realize solar cells with ultra-high efficiency that can be made at low costs. In 2012 he was awarded, together with Harry Atwater, the ENI Renewable Energy Award for his research on light management in photovoltaic materials. Polman is an elected member of the Royal Netherlands Academy of Arts and Sciences (KNAW), Fellow of the Materials Research Society (MRS) and the Optical Society of America (OSA), and recipient of ERC Advanced Investigator Grants (2011, 2016), the Frew Fellowship of the Australian Academy of Sciences (2017), the EPS Research into the Science of Light Prize (2017), the Physica Prize of the Dutch Physical Society (2014) and the Julius Springer Award for Applied Physics (2014). Polman’s group has published over 300 articles in international journals that are cited nearly 30.0000 times. Albert Polman is married to the musicologist Dr. Philomeen Lelieveldt; they have two children, Philine and Fabian. In his free time he is member of the chamber choir Vocaal Ensemble COQU.